Family Science helps children and adults have a better understanding of science concepts and their practical applications. 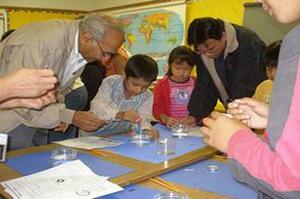 Your school becomes a science lab for families to engage in experimentation together. This family friendly environment allows young and old to discover the wonders of our world by participating in different experiments set up at your school site. Children and adults learn best by doing. Families will participate in multiple exciting hands-on activities. There is no experience necessary to be part of this 60/90-minute live science lab. We will customize a program that will make your Family Science Program a success. This 60 minute program is a wonderful opportunity for the whole family to spend time together and have fun learning about science. Your families will be excited and entertained learning about scientific principles. This family friendly interactive assembly requires a number of audience members to conduct experiments during the presentation that are fun and educational.